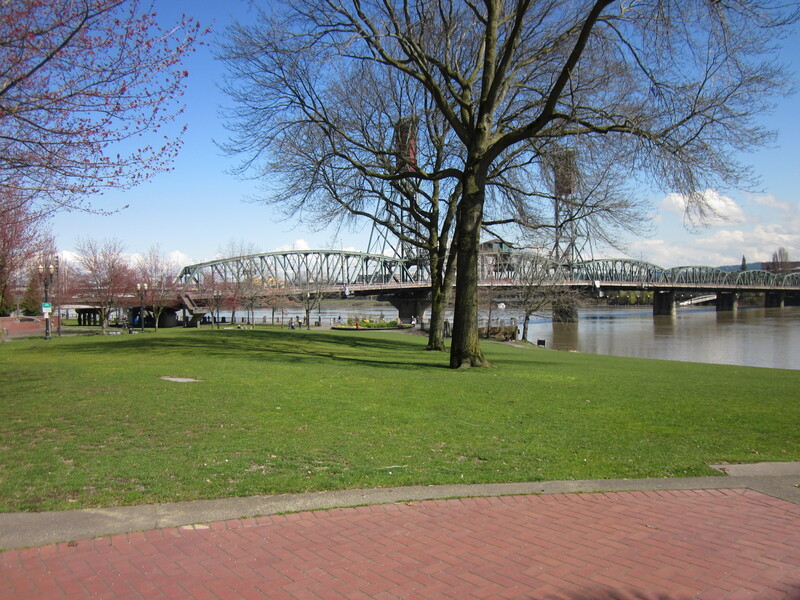 I went to Portland to present a conference paper. Stacy at A Simple Six suggested once that I take advantage of my professional travel to write about riding bikes in multiple cities, which is an excellent idea but seemed like way too much work for me to do consistently. And my trip to Atlanta did not swell my ambition on this front. But I figured I could manage to rent a bike in Portland, especially since it turned out Clever Cycles was about 10 blocks away from my conference hotel. They rented me a Breezer Uptown 8 (ha ha!) It was both familiar and unfamiliar. They put the seat up higher than I’m used to—I have kept my seat low because I like to be able to get a foot down flat with a kid on the back. But I found I liked the new height, and I will move my seat up when I get home. They also had a nifty Axa lock with an integrated chain, which made locking up the bike very easy. And finally, I have to admit that their bike is significantly better maintained. 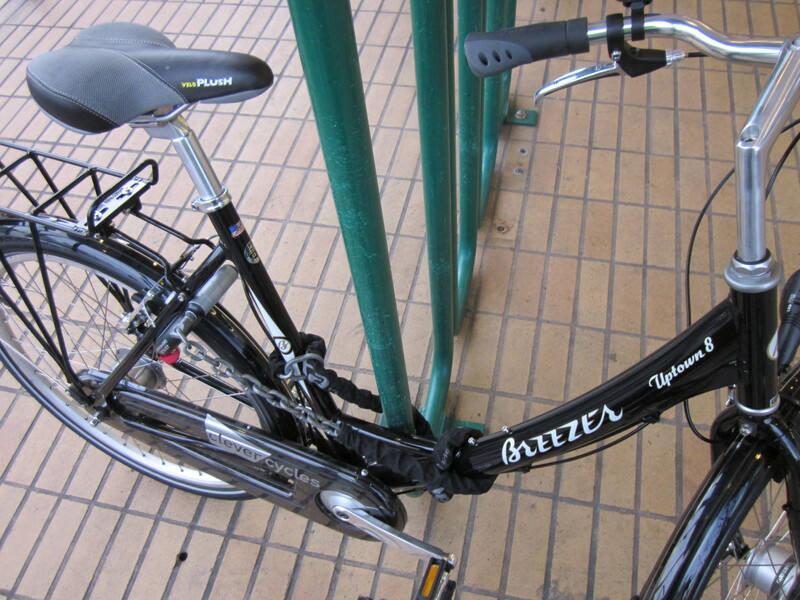 Overall their Breezer was a pleasure to ride, and I should take better care of mine. My co-author Todd picked me up at the airport, because he lives in Portland and because he’s that kind of guy. Thanks to some professional meet-and-greet obligations, we had to squeeze the trip to pick up the rental between a reception and dinner, which meant shoving the bike in the back of his car for a few hours. It felt a little stupid to rent a bike and then drive it around, but oh well. I’ve done stranger things. Guess who's coming to Portland? After dinner he dropped me off at Powell’s Books, with its expansive bike racks and world-renowned selection of reading material. I was sure they’d have a city bicycle route map somewhere. 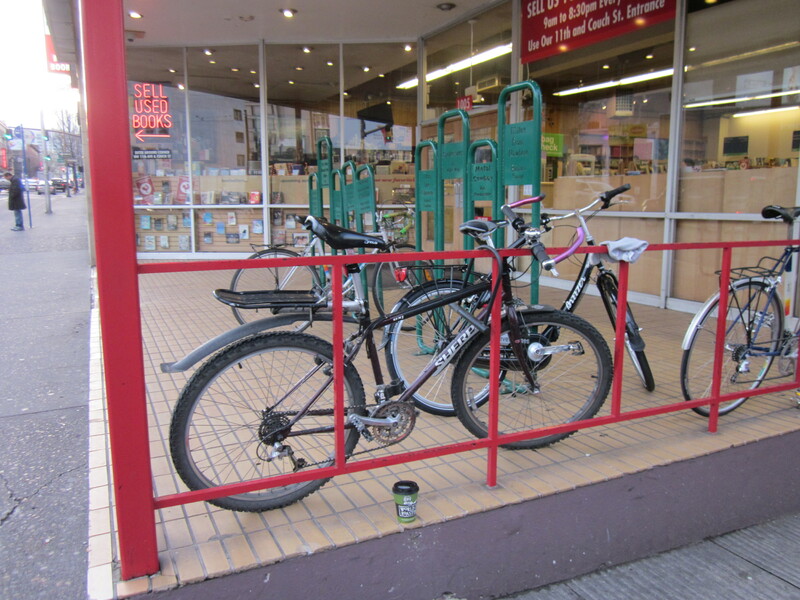 But despite the four bicycles locked up immediately outside the cash register, the guy staffing the information desk was completely mystified as to where I might find a bike map. Eventually a co-worker stopped by to investigate. “In the bicycling section, of course,” she said. With that hint he could point me in the right direction, but it turned out that there were copies of the map strewn through every room. He could have sent me anywhere. 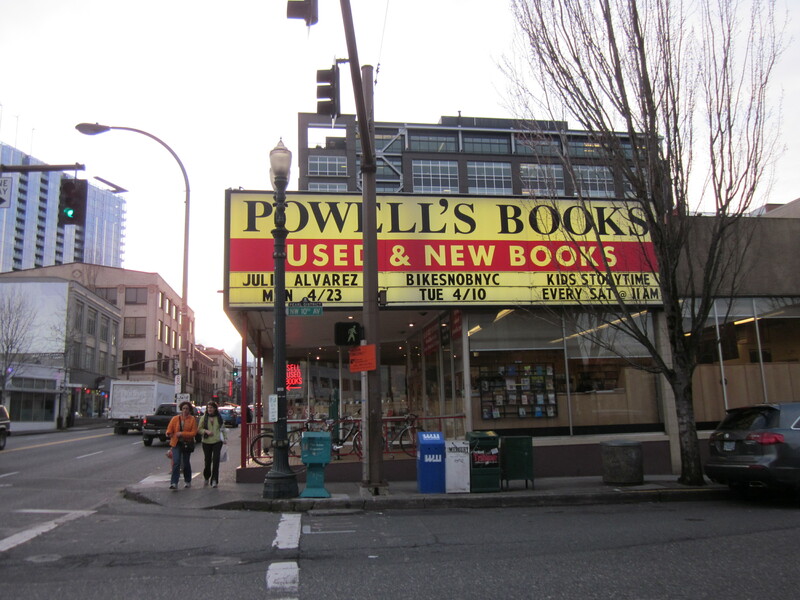 I left Powell’s after browsing for a while with two books and a bike map. I would have left sooner, but it felt very intimidating to ride out into a strange city after dark, on a sort-of-strange bike, with only a limited sense of where I was going. However I decided a few years back to stop making choices based on fear, and feel like overall this decision has made my life better, at least on the occasions when I follow through. And I certainly wasn’t going to walk that bike back to the hotel. In the first few minutes of the ride back, I realized that despite my nervousness, riding a bike in Portland was going to be okay. Drivers in Portland are clearly used to bicycles, and were predictable and courteous. Eventually I ended up riding along the river, where I wished that I had thought to wear my winter gloves. I saw a crowd of people, some with bicycles, along the way, mixed in with shopping carts; it turned out they were there to meet a homeless services van. I passed other riders and pedestrians and looked over the city and the lights on the bridges. Portland is pretty, and it is flat; I can’t remember the last time I rode in San Francisco for over ten minutes without having to shift gears. Maybe never. By the time I got to the hotel, I decided that riding a bike in Portland was much better than okay.